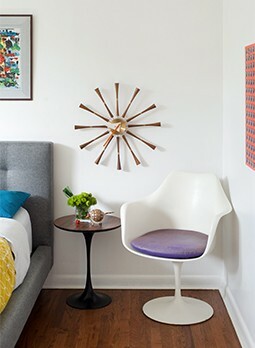 When Midcentury Modern enthusiasts Randy Shemaitis and Keith Zabel of Chicago found themselves visiting Palm Springs more and more often, Randy finally asked, “Can we move here so we can vacation somewhere else?” They worked out the logistics and began their hunt for the perfect Palm Springs home. That perfect Palm Springs home turned out to be a 1960 Jack Meiselman home in the Sunmor neighborhood of Palm Springs. Boasting a large lot, magnificent views, and quiet community, Keith and Randy bought the house in 2012. One of its bonuses was a guest house built in 1971—perfect for hosting visiting friends and family as well as for renting out to vacationers. 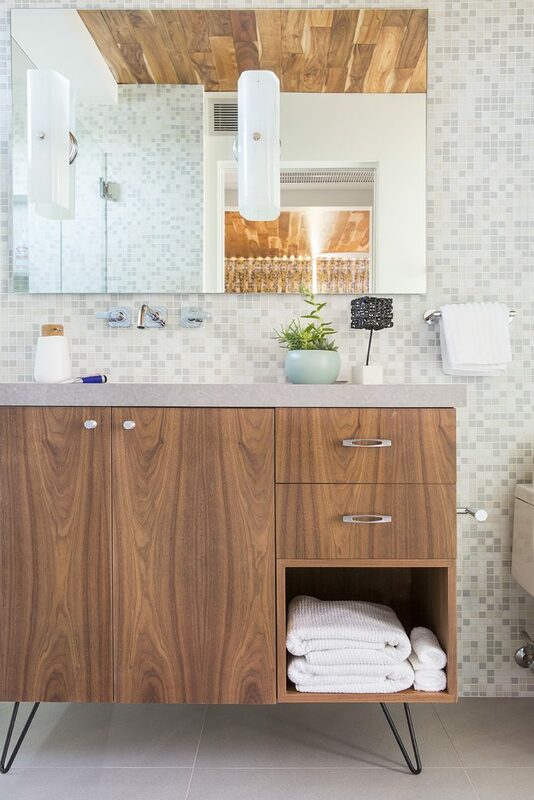 match that of the house, created a spa-like bathroom, installed Heath Ceramic tile as a backsplash in the kitchenette, and extended the wood ceiling paneling beyond the floor-to-ceiling sliding glass door to the eaves. Walking past iconic breezeblocks and up to the private entrance, you step through the ‘Poolside Blue’ door and into a private desert getaway. The couple’s addition of large sliding glass doors and windows creates an open concept and allows extravagant views of the mountains and landscaping. “We want them to think ‘Palm Springs’,” answers Keith when asked about how he wants his guests to feel upon entering the Stardust Oasis. Stepping out onto the private patio allows for a better look at the incredible and desert-appropriate landscaping done by Randy and Keith. 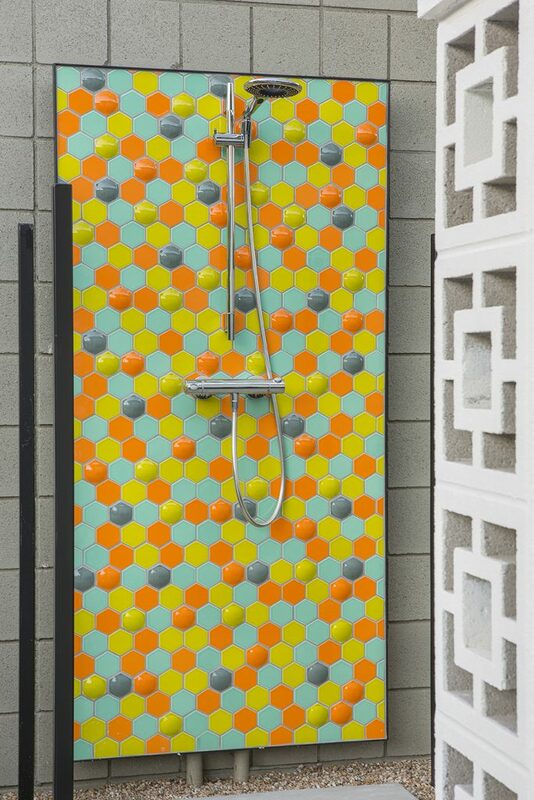 Guests also have access to a private outdoor shower—tiled with dimensional hexagons from Clayhaus Modern Tile—for a truly relaxing bathing experience. 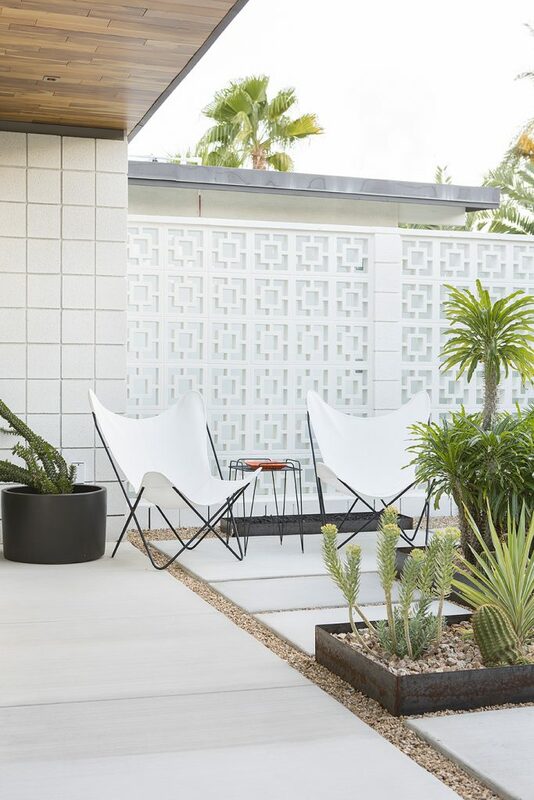 To create additional privacy while still achieving the iconic look of screen block, glass was added behind the wall of breezeblocks on the patio. 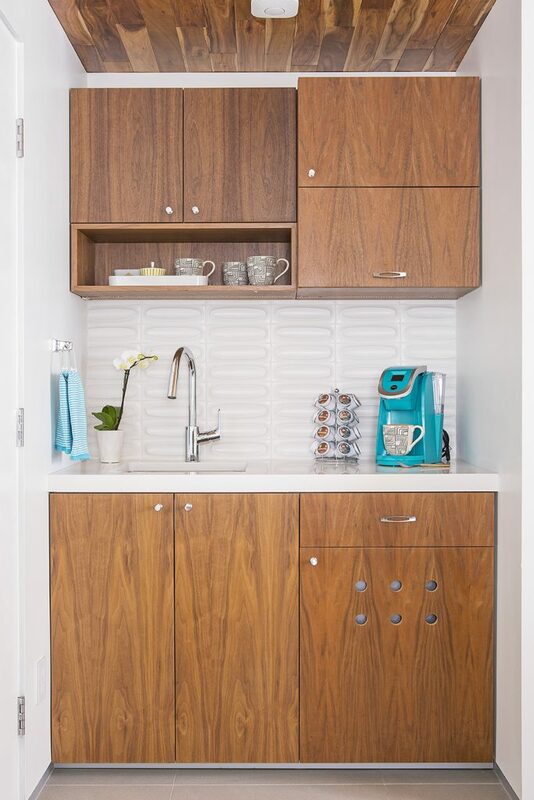 These newly sourced breezeblocks mimic the design of originals that can be found in the front of the house. This pattern can also be seen in some shower drains throughout their home! 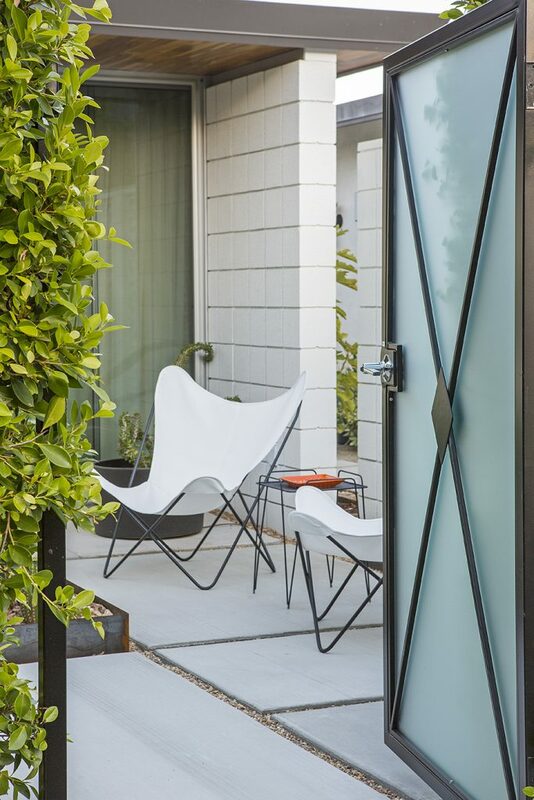 With gate access to the main yard area, guests pass through a gate to see a beautiful custom-made fountain, inspired by the firepit in the lobby of the iconic Parker hotel in Palm Springs. Walking further down the pathway, guests can soak in the desert sunshine while taking a dip in the shimmering pool. But perhaps the best perk of the Stardust Oasis Guest House is the possibility of Keith and Randy’s friendly kitty, Chatty Cathy, stopping by the backyard to say hello. To see Keith and Randy’s house, don’t miss the spring issue of Atomic Ranch! If you’d like to book a stay at their Stardust Oasis Guest House, click here.